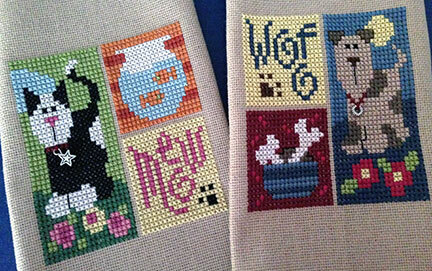 Here are Lizzie Kate’s “Woof” and “Meow” finished as Christmas ornaments. I tried several different finishing techniques before deciding on this one. Sometimes simple is best! 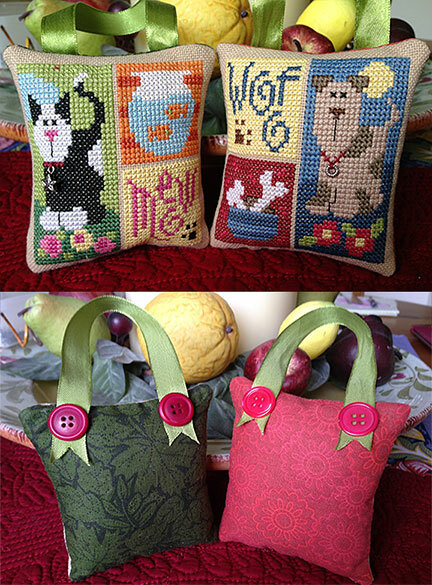 I hope my niece and soon-to-be nephew-in-law will like them as much as I enjoyed stitching them. Both stitched on 28-count evenweave in Mushroom from Michael’s Crafts, using DMC floss as charted. 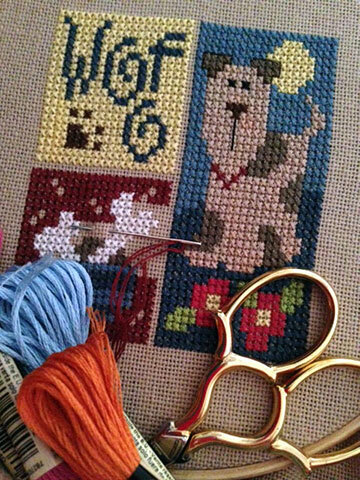 Both “Woof” and “Meow” are now complete, just have to finish them as ornaments. I changed the floss colors slightly so they would match better, and I didn’t have the charms called for, so I improvised. These Lizzie Kate designs are cute and cheery, I like them very much. Almost done with this little Lizzie Kate Block Flip-It called “Woof.” I found some matching wide green rick rack for the trim when the piece is done. If I have the time, I plan to start “Meow,” its sister piece, later tonight. Once again I’ve resorted to using ibuprofen gel on my hands during the day and soaking them in Epsom salts at night to help alleviate the discomfort. Along with stitching for only relatively brief periods of time and take plenty of breaks, this seems to be working out pretty well, and is allowing me to get more stitching done than I have been able to do in a long time.